[Contains sensitive content] On a warm evening in a small Mexican border town, men and women started disappearing. Local officials were warned to stay away and when it was all done, up to 200 people were gone. The Making of a Massacre is five-part true story detailing how well-intentioned efforts to curtail the drug trade by the US and Mexican governments had devastating effects. 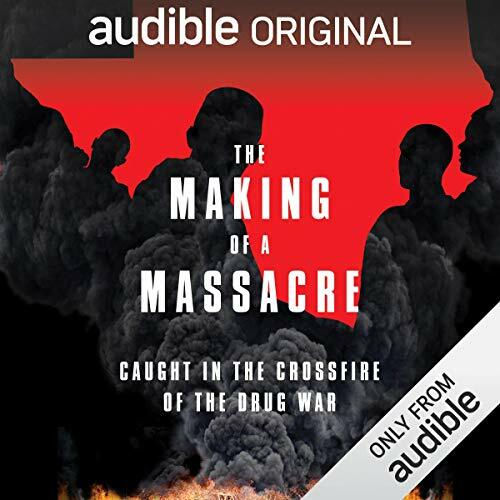 Led by ProPublica’s award-winning journalist Ginger Thompson and featuring true to life performances by notable actors Cheech Marin, Danny Trejo, Alana del la Garza, Clifton Collins Jr. and Snow Tha Product, listeners will hear how a town was caught in the crossfire of the drug war. When you add Making of a Massacre to your library you will receive all 5 episodes, each with a runtime of approximately 25 minutes. To hear more great podcasts and short listens, visit Audible.com/AudioShows. How a drug cartel signs up new members. What does it feel like when dark forces seize control of your town? The DEA looks to arrest the wife of a cartel member. Good overall. If you enjoyed this, I can't recommend enough the Power of the Dog series by Don Winslow. That aside, it was interesting, especially since it was non-fiction. The production was mediocre for an Audible Original. The would play music at almost the same volume as a narrator at points, and occasionally that music would have vocals, which made understanding the narrator at times near impossible. I enjoyed it overall, but they went a little too heavy on the production. I'd recommend it though, just make sure you have you attention very well devoted to it, as parts of it can be difficult to understand if you aren't really focused on it. This is like a movie for your ears. Some of the actors are better than others, but it's a wonderful listen! This was an excellent series detailing the true story of a drug investigation gone horribly wrong. Pro Publica reporter Ginger Thompson spent a great deal of time investigating this story. She relates her investigation with her interviewee responses read by actors. The mistakes of several DEA agents led to a massacre in a Mexican town. At times chilling, this is a must listen that informs the listener of how drug investigations are handled regarding cartels. The performances were excellent. This one will stay with you. Not only impressed with the story, but also the actors impersonating the real figures. Simply amazing! The narrator and the voice actors were excellant. this is a great listen. I would recommend it to everyone but it did make me want to cry by the end. This is genuinely an amazing story where truth is actually more evil than fiction. I have seen much less extreme stories in fictional thrillers described as being unrealistic. It's an unbelievably tragic story of oppression, corruption and unrestrained violence. The fact that it can happen in the modern day will seem almost inconceivable to most of us in the UK but is unfortunately a reality for some. The production values are as you would expect very strong but to me some of it seemed overly dramatic in tone. The story is an incredible one in its own right so introducing the chapters in the same tone as an action movie trailer and so on really isn't needed. Maybe it does help for a US audience, I couldn't say, but it did take a little of the impact away for my personal tastes. That said, it is a story that needed to be told, and it needs to be heard so if you have a couple of hours free take the time. just don't expect any faith you have in the goodness of humanity to survive unscathed. This is a thought provoking and disturbing piece of journalism. It is frightening to see the way in which a drug cartel moved into a rural town and affected the lives of everyone who lived there. The ruthlessness of the cartel is truly shocking. Well worth a listen. Sad and shocking tale from the war on drugs. America's role in the deaths of many innocent people. I feel sorry for ordinary Mexicans who have to live with the corruption and power mad cartels. Sheds some light on something both th American and Mexican Government are reluctant to talk about. Interesting though horrific story. Some of the witness testimony was way too faint and hard to hear. Difficult to understand why when it is being voiced by actors but a lot of them were faint and had music or the original Spanish in the background making it difficult to understand what the person was saying, especially in the last episode. Sometimes the cruelty of humans and their blindness to the real twisted horror of the world is shocking. I read this as I wanted to learn more about it. I heard nothing about it where I live and the fact that people try and bury this, hide the full horror worries me. We are not perfect and never will be but the cruelty of the cartels and the depth of their corruption saddens me. A must read if you can stomach it. Can be a little slow at times. Very very touching and anger inducing. Well made but hurts to the core what humans are capable of. Puts life in perspective. This telling was a moderately sympathetic narrative of a horrific set of events in a corrupt government system. It is a story which is ultimately about human beings being unwilling to take responsibility for decisions with drastic consequences and hiding behind the mask of institutions and buck passing. 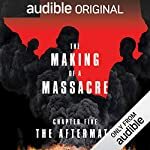 I found the narrator a skilled interviewer but somehow lacking in empathy for the victims of this horror. Really enjoyed this. Terrifying in its detail and frustratingly tragic in how avoidable the event was. Well written and investigated and really enjoyed the production. I picked Cheech and Danny's voices as well! It was quite eye-opening in how such a criminal take over of a society can affect the innocent bystanders left with no options when those in authority refuse to do their job. I think once you're taking payments or making millions you have no defence. Many should be jailed for failing their community. Sympathies to the families. Thank you for making this story. This is a great account a dark part of US/Mecican history. The story breakup 30min segments was great. Excellent use of voice actors, sound quality fantastic.